Phuket offers a myriad of activities to suit every interest. Take in the natural beauty of Khao Phra Thaeo National Park, splash around in the cool water of Bang Bae Waterfall, trek through forests on elephant back or visit the impressive Chalong temple. 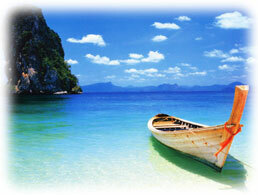 Phuket is also the perfect base for exploring nearby islands. Be mesmerized by the mysterious sea caves and limestone outcrops in Phangnga Bay or spend the day diving in Phi Phi Island or snorkeling among colourful coral colonies off Coral Island. Patong Beach is the most popular beach in Phuket, fully self-contained with a gamut of watersports available, a vibrant night market along Bangla Road and the greatest concentration of bars, restaurant and spas. In addition there are luxurious hotels on Bang Tao Bay, secluded resorts on Panwa Beach and idyllic resorts on Kata Beach and Karon beach. The hardest part is deciding which hotel to book. The Sugar Palm Resort & Spa hotel is located on the second road of Kata beach and close to nearby local restaurants and shopping area, one a minute walk to the opposite beach. Transfer from airport takes 1.5 hours approximately. The Best Western Ocean Resort hotel is situated at Karon beach road on the hillside among the coconut groves overlooking Karon beach and Karon lagoon, guests have to walk across the road to the beach front, 15 minutes drive away from Patong down town. The Kata Palm Resort is located on the second road of Kata Beach close to Club Med. It is within easy access, 3 minutes walk to the main beach. It takes approximately 1.30 hours drive from Phuket airport. The Tropical Garden Resort hotel is located on the hill, take only 3 minutes to walk to the beach " Kata" and take around 1.5 hours from Phuket international airport by car. The Absolute Seapearl Beach hotel is next to the beach, just across the road to the beach. The hotel is located in a very prime area at the door step to Patong downtown. There is just the road that separates the hotel from the beach. The Layan Beach Resort & Spa is located on the northwestern coast of Phuket Island, 20 minutes' drive from Phuket Airport, 30 minutes' drive to Phuket town and 10 minutes to the Laguna complex. The Cape Panwa is located on Cape Panwa beach this beach is 1.5 hours drive away from Phuket International airport, 45 minutes away from Patong. The Patong Paragon is located on Patong dowan town area just a minute walk to Patong night life and shopping area, 5 minutes walking to the beach. Hotel is 35 minutes drive away from Phuket international airport. The Laguna Beach resort is centrally located on the exclusive Laguna Resort and is approximately 25 kilometres from Phuket International Airport, on the mid- western of the island.